A little sweet, a touch of tart and a whole lot of tastiness is what you'll get from these delectable Napoleons...and using instant pudding to make the filling is a delicious time-saver. Unfold 1 pastry sheet on a lightly floured surface. Roll the pastry sheet into a 12x9-inch rectangle. Cut into 24 (3x1 1/2-inch) rectangles. Repeat with the remaining pastry sheet. Place the pastries onto 2 baking sheets. Brush the pastries with the egg and sprinkle with the granulated sugar. Bake for 10 minutes or until the pastries are golden brown. Remove the pastries from the baking sheets and let cool on wire racks for 10 minutes. Split each pastry into 2 layers, making 96 in all. Prepare the pudding mix in a medium bowl according to the package directions except use 1 cup milk. Stir in the ginger root and orange zest. Fold in the whipped cream. Spread 1 tablespoon pudding mixture on 48 bottom pastry layers. 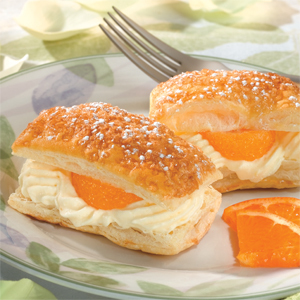 Top each with 1 orange segment and a top pastry layer. Sprinkle with the confectioners' sugar. For 1 1/2 cups sweetened whipped cream, beat 3/4 cup heavy cream, 2 tablespoons sugar and 1/4 teaspoon vanilla extract in a medium bowl with an electric mixer on high speed until stiff peaks form. 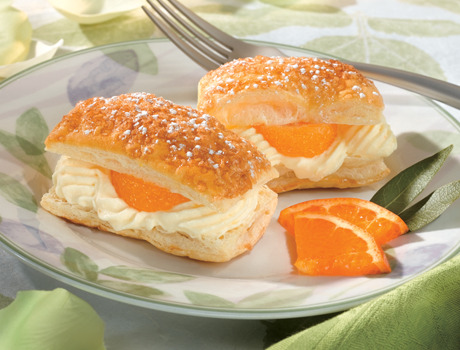 Make-Ahead: You can prepare and refrigerate the Napoleons up to 4 hours before serving.